We recently did a series based on the book ‘Followers of the Way’ by Simon Reed. How refreshing and practical it was! 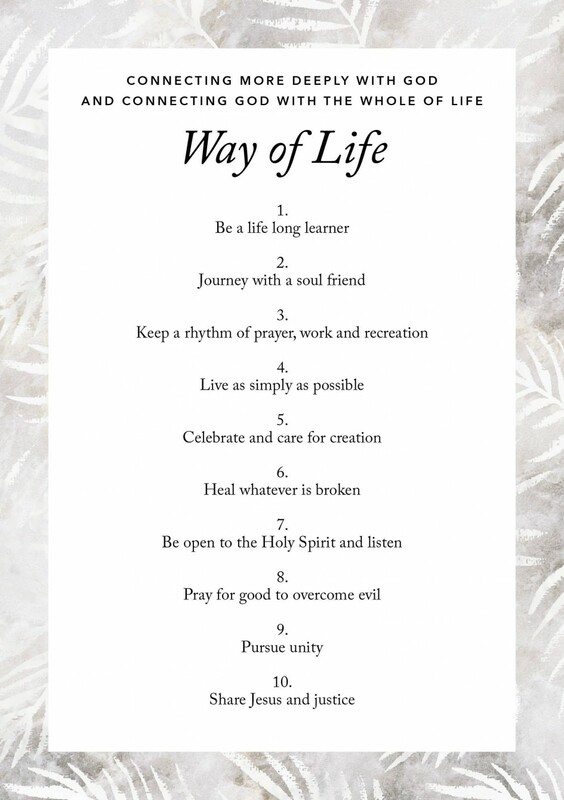 Check out the ‘way marks’ in the image that encourage us on a way of life that connects God with the whole of life. This looks great but how on earth am I going to do all this? Heres the good news. First of all, A way of life isn’t called a way of life for nothing. You don’t have to do it all at once. In fact you’ve got the rest of your life to work out what this means. And whats more, A way of life is meant to be a way that gives life. It is a response to the grace of God who is already with us and in us by His Spirit, rather than a ladder of good works that is designed to bring us close to God who is far from us. The word rule comes from a Greek word that means trellis. A trellis is a support system for vine or plant that enables it to grow upward and bear fruit. Like a trellis, a rule of life supports and guides our growth. What matters is our life in God. That’s the living plant. Our way of life is the supporting structure that helps it to grow. How then do we Build our trellis? The waymarks may apply quite differently from one person to another. So The first step is to work out your personal application of it. And Here’s more good news: you are probably already doing quite a lot of it already! How am I seeking to grow in knowledge? How do I experience companionship on my spiritual journey? What is my personal rhythm of prayer, work and recreation / rest? What are my guiding principles in my use of money and possessions? What steps do I take to care for the environment? How do I help others find healing? What do I do to enable the Holy Spirit to guide me? How do I support others through prayer? How do I show welcome and hospitality to other people? How do I help others to find faith in Jesus? Now you can see how much of this way of life you have covered, already follow to some degree. You can now start to give attention to the gaps. The advice is trying to add at most three or four new things in total to your way of life in any given year. How do you choose? Discern? Find out a bit more about an area you’re interested in. Opportunity! Let the community know in what ways, why and how we can support you.